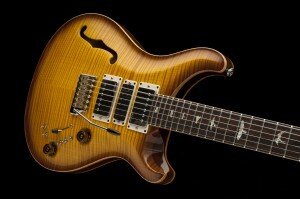 PRS Guitars and John Mayer have announced a special run of Private Stock “Super Eagle” instruments. The Private Stock Super Eagle is the result of a very close collaboration between famed guitar maker Paul Reed Smith and Grammy-winning musician John Mayer. The goal of the partnership was to create a highly-sophisticated and unique instrument that at once reveres the history of guitar-making and guitar tone but pushes the boundaries of materials, design, and craftsmanship. The result is a truly new PRS instrument that embodies the PRS Private Stock culture of meticulous workmanship as well as Mayer’s keen eye for playability, tone, and detail. Some of the more distinctive and personalized specifications Mayer and Smith decided on for this special run of instruments include a longer (for PRS) scale length of 25.375”, specially-wound 58/15 JM treble and bass pickups with a specially-wound Narrowfield JM pickup in the middle position (with three individual coil-tap mini-switches), a JCF Audio preamp with treble boost, as well as a hand-signed sticker in the f-hole of the guitar that was designed by Mayer’s friend David Smith (who also designed the cover art for Mayer’s 2012 “Born and Raised” album). The pickups deliver a bright, clear tone that has been heard in venues across the USA in Mayer’s recent performances with Dead & Company. But according to Mayer, this guitar won’t stop with Dead & Company. “Paul and I worked very closely to create this guitar, and the result is an incredibly refined and elegant instrument. It has a completely new sound and spirit. 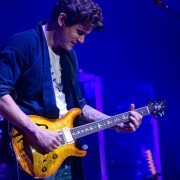 It’s been a joy to play and I’m excited to share that experience with other guitar players,” John Mayer.